Shane and Elaine, look forward to serving their guests at the highest possible standard and hope to see you soon. Shane has a long history in hospitality having spent the best part of a decade working the islands in the Whitsundays, whilst Elaine brings her vast experience in business to the party. 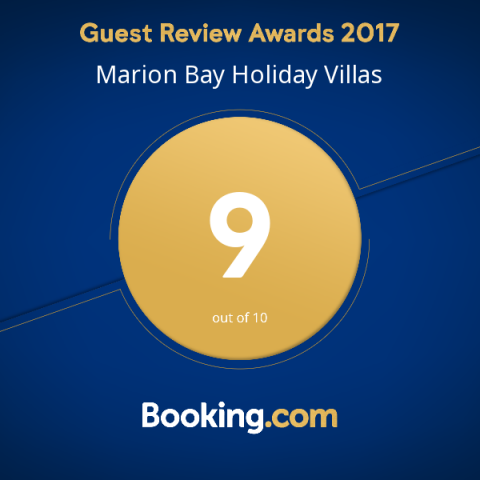 We are dedicated to providing you with a wonderful experience at the villas and in Marion Bay in general. Since taking this role on we have worked tirelessly to improve the standard of the villas and will continue to do so, as we work toward bringing a resort feel for you to enjoy. Yorke Peninsula. A favourite hotspot for SA short holidays, weekend getaways, and short breaks, in fact because there is so much to see and do, people look for Yorke Peninsula accommodation, so they can spend more than just one day exploring the history, culture, wildlife and beauty Yorke Peninsula offers. Marion Bay Holiday Villas offer rental accommodation for couples and families, ideally located at Marion Bay. Marion Bay is one of the most visited destinations inside Yorke Peninsula because it has something for everyone. There is the fishing Marion Bay is famous for, attracting people from all over South Australia and Australia wide. Then there is Innes National Park, with interactive walking trails, lighthouses, and famous shipwrecks. Marion Bay Holiday Villas are chosen for people looking for Innes National Park accommodation as well as Yorke Peninsula accommodation because they are conveniently located, self contained, modern, have individual private balcony’s and are exceptionally priced. Yorke Peninsula offers what people fly interstate and overseas for, at a fraction of the cost; which is one reason why tourism South Australia promotes short holidays South Australia has there. Ardrossan Well known for blue swimmer crabs, red cliffs, local museum and ‘stump jump plough’. Balaklava The annual Balaklava cup, and the ‘Rocks reserve’; a unique rock formation are highlights. Corny Point Swimming beaches, boat fishing, lighthouse walks are all here. Edithburgh Wattle Point Wind Farm, scenic harbour, floating pontoons and park lands are well worth a look. Marion Bay One of the most popular fishing spots in Australia – just ask Rex Hunt! 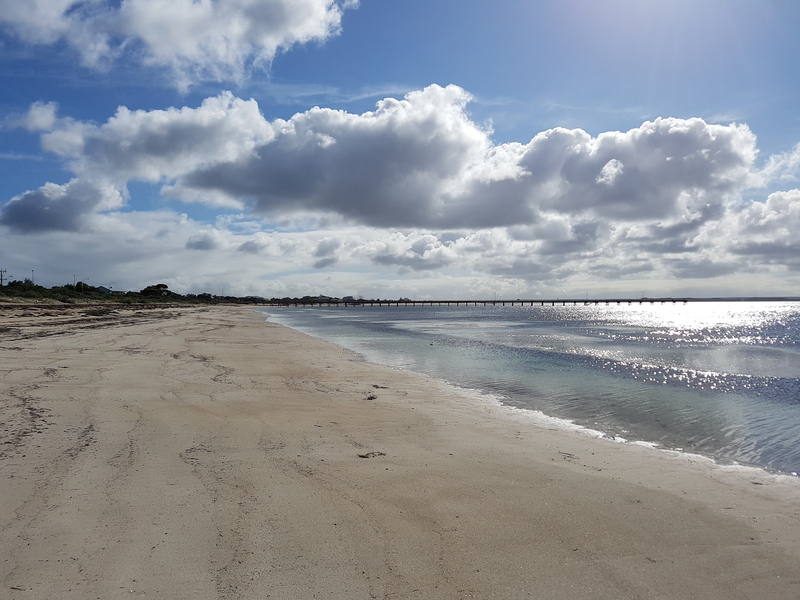 Marion Bay is the perfect Yorke Peninsula accommodation base with everything to entice weekend getaways for couples to short holidays South Australia for families. Minlaton The barley capital of the world with arts and crafts, plus a whole lot more. Port Vincent Lookouts, walking trails, postcard views and fishing make Port Vincent entertaining. Stenhouse Bay Heritage listed jetty, walking trails and its own shipwreck are just some of the reasons Stenhouse Bay is a must see!. When planning your weekend getaways look at the Marion Bay weather forecast which is updated hourly on our website, so can pack only what your going to need. We have also supplied you with step by step directions to Marion Bay, from your house, which can be printed out. People looking for luxury Yorke Peninsula accommodation, cheap, take a look at the rental accommodation Yorke Peninsula has at Marion Bay Holiday Villas, where we’re sure your first stay with us wont be your last. There are many short holiday destinations South Australia promotes, with Marion Bay being one of the most popular. 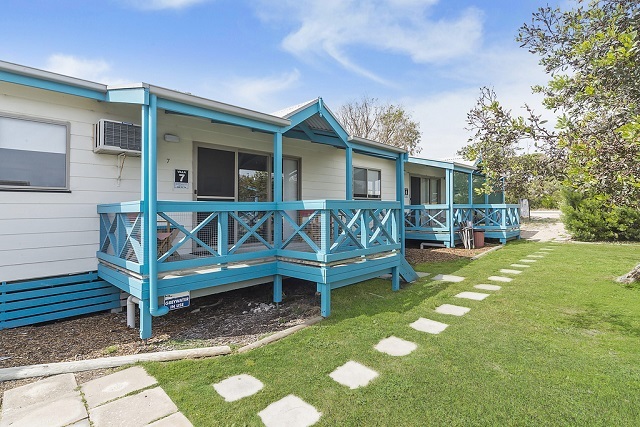 Marion Bay Holiday Villas offers self contained accommodation ideally located for exploring Yorke Peninsula and Innes National Park or for those wanting to take advantage of the Marion Bay fishing. Weekend getaways are becoming more popular each year in South Australia, with thousands of people from all over the state visiting Marion Bay at the tip of the Yorke Peninsula. Weekend getaways for couples, families and groups of friends perfectly catered for at Marion Bay Holiday Villas. Take a look at the Marion Bay weather conditions for the month you are coming down, and also the Marion Bay weather forecast which is updated hourly on this website, so you know what type of clothing to bring. You can also see step by step directions to Marion Bay, even from your house, with the distance and approximate time it will take to reach us. People looking at Innes National Park accommodation choose to stay at near by Marion Bay Holiday Villas which is situated close to the parks entrance. Directions to Marion Bay can be found on our website. At Innes National Park you can enjoy the crystal clear waters, marval at the rugged coastlines sculpted by the Southern Ocean and explore remnants of South Australia’s mining and maritime history. There are salt lakes further inland, amongst the mallee woodlands. 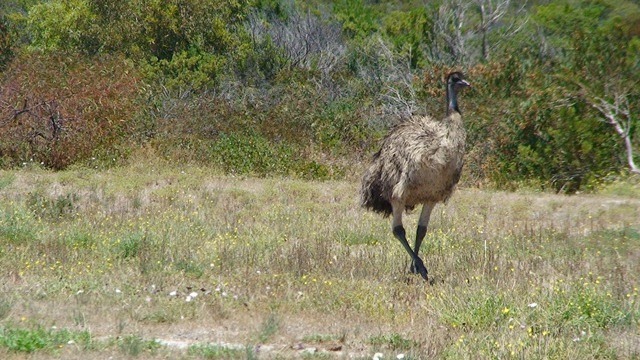 The park comprises 9,232 ha of coastal vegetation, representing one of a very few remaining areas of significant vegetation on the Yorke Peninsula. Diversity of habitats, heritage and coastal scenery, Innes National Park provides a wide variety of recreational opportunities such as fishing, camping, bush walking, bird watching, photography, and for the more adventurous; surfing. Innes National Park is open for SA short holidays and weekend getaways 24 hours a day, seven days a week, with entry into the park costing just $8.50 per car for a day pass (as at January 2011). Innes National Park has many walking trails that cater to people with different interests and level of fitness. Providing some of the best coastal views South Australia has to offer; we recommend taking the ‘Stenhouse Bay Lookout Walk’, but for those after a shorter walk, enjoy seeing the Cape Spencer Lighthouse, and stand at the tip of Yorke Peninsula South Australia and see Kangaroo Island. During the winter months the cliff tops at Stenhouse Bay and Cape Spencer provide the ideal location to see Southern Right Whales, so if having ‘front row seats’ to this rare site interests you, make sure you book ahead for Innes National Park accommodation with Marion bay Holiday Villas. Over 140 species of birds, many of conservation significance, can be found within Innes National Park, so keep a look out for the rare Osprey and Malleefowl. Around 333 native plants have been recorded in the park, 115 of which are of conservation significance, making up a diverse range of vegetation associations and wildlife habitats. Innes National Park turns into a brilliant display of colour during the winter and spring when the wildflowers and shrubs come into bloom, as does the whole region of Marion Bay. 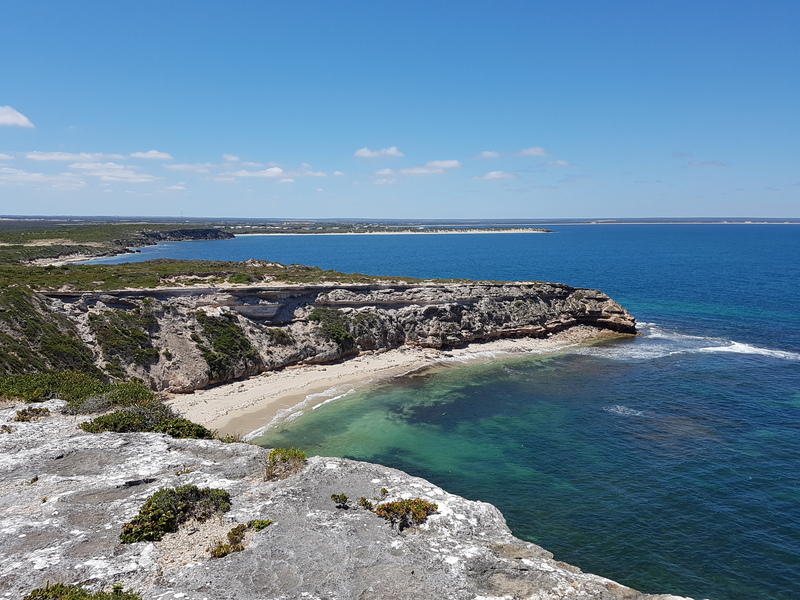 Within Innes National Park there is a beach for everyone, but please take care when surfing or fishing as there are many potential risks including submerged objects, unstable cliffs, strong currents, slippery rocks and changing conditions. Nick your host for Innes National Park accommodation at Marion Bay Holiday Villas can help with his local knowledge. A wide variety of fish species can be caught off beaches in the park or from the Stenhouse Bay Jetty, where you can expect to catch Squid, Mullet, Tommy Ruffs, Garfish, Sweep, Mulloway and Whiting throughout the year, while Browns Beach is one of South Australia’s best salmon fishing areas. Over 40 shipwrecks lay off the coast of Innes National Park and the Yorke Peninsula South Australia. A maritime trail along the coast of the park tells the story of where and how the ships sank, the most famous wreck within Innes National Park is ‘The Ethel’, which came aground in 1904 when it was driven ashore during a large storm off the coast. Visit the remains of the ship on Ethel Beach. 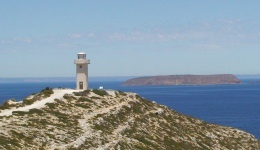 There are three lighthouses within the park at Cape Spencer, West Cape and Peter Island, with the Cape Spencer and West Cape lighthouses accessible via easy going walking trails. The park is one of only a few places in the world where living stromatolites are known to exist. Stromatolites consist of layers of blue-green algae (or cyanobacteria). New layers develop on top, closest to the light, trapping whatever silt may be present. Old layers underneath are impregnated with calcium carbonate and become fossilised. In Innes National Park you can see the dome-shaped structures occurring around the edges of the salt lakes. Carbon dating has indicated that some of the stromatolites are about 3,000 years old. Book your Innes National Park accommodation holiday packages with Marion Bay Holiday Villas. Thank you for your interest in becoming a part of our little family, your timing couldn’t be better. Recently the Yorke Peninsula Tourist Guide went global, with a push by the South Australian Tourism Commission throughout Asia and Europe in both paper and digital formats; Marion Bay’s tourist income is set to explode. Overseas visitors are starting to discover this beautiful area and we are primed to capitalise. Combined with our management team that are dedicated to bringing a resort standard to the property, we are expecting exciting times in the future. Each Villa produces about $18,000 gross income per year, a figure we expect to grow. This number is from the latest taxation figures submitted over the last 2 financial years and will be confirmed by our accountant. Please note, our accountant will also itemise the expenses you can expect to pay from this gross income when you meet him face to face. This presentation is for general discussion purposes only. HOW DO WE GET BOOKINGS? Our income is produced via several different sources. We are listed with all the major booking sites, including Stayz, Airbnb, Booking.com and Expedia, plus a few lesser known sites. All are professionally managed via the Beds24 channel management software, with excellent results since installation. We have also been proudly associated with Sunseeker Holidays for several years, who have 3 call centres located in Newcastle, Brisbane, and Melbourne. We also run Travel Auction promotions annually. We have an ever-extending list of regulars who come down every year, often staying for up to a week across several villas. Repeat visits from guests who stay with us one, two or even three times have been steadily on the rise; a result of our advertising with the Yorke Peninsula Tourist Guide and targeted social media campaigns, as well as our increased online presence through geo-tagging in google combined with other tools. 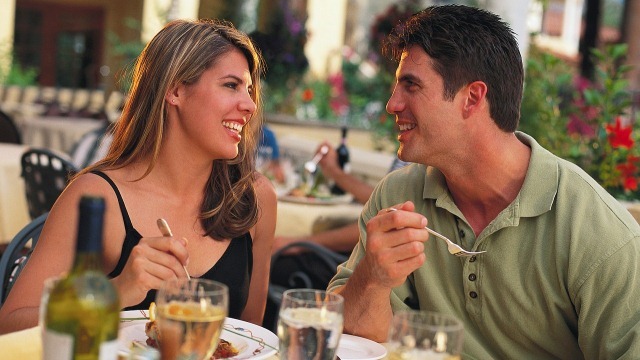 Our word of mouth references has been excellent and we often re-book within a few days of someone’s first stay with us. Overall, these sources have combined to produce very high occupancy rates compared to others within the town. Holiday home and shack sale prices in this area have all been well over $200,000; even the vacant blocks of land have sold recently for more than $110,000. Ten minutes of your time searching online will confirm these figures. You should expect good capital growth, as investment opportunities of this nature are very limited in Marion Bay and there is an immediate growth factor from your share of the common areas value under the body corporate structure. There is a finite amount of property available and developments such as ours are “like hen’s teeth”. We are one of only two properties of type within Marion Bay, with no current prospect of future development. We do not guarantee your rate of return but based on projections, 5.0% would seem quite realistic. Combine that nice rate of return with free holidays for life in Marion Bay, then consider the possibility of future capital growth and your decision should be easy. There have been recent upgrades to Innes National Park, with 250,000 visitors per year expected in the foreseeable future. State and federal governments have been spending millions on infrastructure in the region, we were amongst the first to be NBN ready. New boat launching facilities are also on the local agenda which will bring more boaties to the town, increasing our revenue and the overall property values throughout the town.